Top city chef Glynn Purnell cooked up a storm in the boxing ring when he took part in a charity fundraising. Mr Purnell took part in three bruising rounds against Wayne Evans at the Holiday Inn, with former world middle and super-middleweight champ Steve Collins refereeing the clash. The event raised almost £19,000 for bone cancer victim James Freeman, a Birmingham 22-year-old who needs cash for life-prolonging treatment in Germany. Mr Purnell – who runs acclaimed city eatery Purnell’s – didn’t emerge unscathed from his titanic tussle with Evans, the chef’s trainer at the Jewellery Quarter’s BoxFit gym. He said: “My nose resembles a plum tomato, but I made sure I reciprocated. “They raised my hand, but I think it was more of a gesture. It was a good scrap. We have a motto in the gym, ‘train hard, fight easy’ and it paid dividends. Because Wayne’s my trainer, it was master versus student, which was brilliant. Mr Purnell, who weighs 14 stone, is no stranger to the sport. 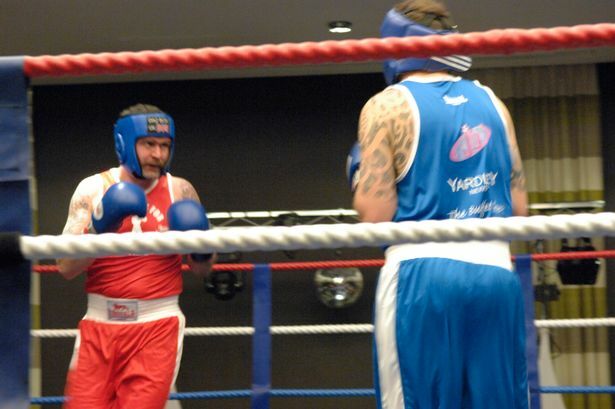 The 39-year-old’s taken part in three “white collar” bouts – winning two – and has a kick-boxing background. He also sponsors a boxing gym in his native Chelmsley Wood, WBC Fight Club run by Paul Webb. The sell-out Holiday Inn battle was dubbed “Fighting for James” and featured eight contests.